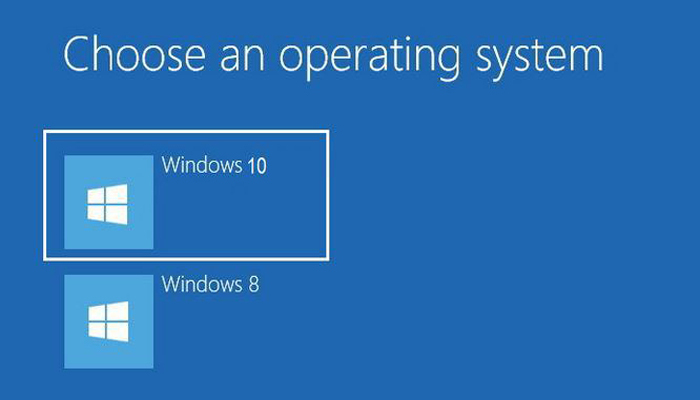 2 Are you ready to Dual Boot Windows 10 alongside Windows 8? Microsoft succeeded in creating a huge demand for their new operating system. It indeed is innovative, feature- rich and elegant than every other predecessor. Haven’t you upgraded to Windows 10 yet? We all know that new version of anything is better than older ones. In that scenario, you already upgraded or thought to do it many a times. But, I won’t recommend making Windows 10 your primary OS. As it is new, and Microsoft has introduced some new features, you can’t expect the first Windows 10 version to be the best in class. There are chances to have bugs and compatibility issues. If you are dying to experience the features of the newest version, one option is to make your PC a dual booting machine with Windows 10 and your current OS on it. Here, I am showing you a way to dual boot Windows 10 alongside Windows 8. If your current OS is not Windows 8, only the first step will be slightly different. So, don’t worry about that. Before taking action, let me tell you something about dual booting. Skip the next para if you know what dual booting is. Dual booting is a way to use two different operating systems in a system. However, you can’t access two of them at a time. The biggest advantage of dual booting Windows 10 alongside Windows 8 is that you can use your computer even after the newer OS gets corrupted. You will be asked to choose between the two at startup. 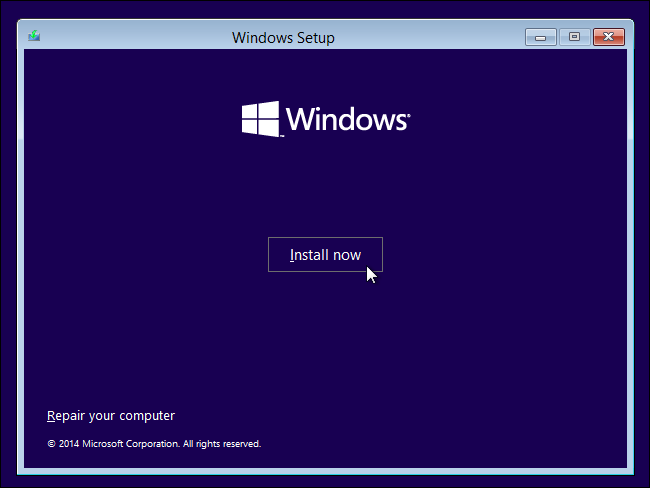 Follow the steps given below to setup a dual booting machine with Windows 10 and 8 as well. It is as simple as that. 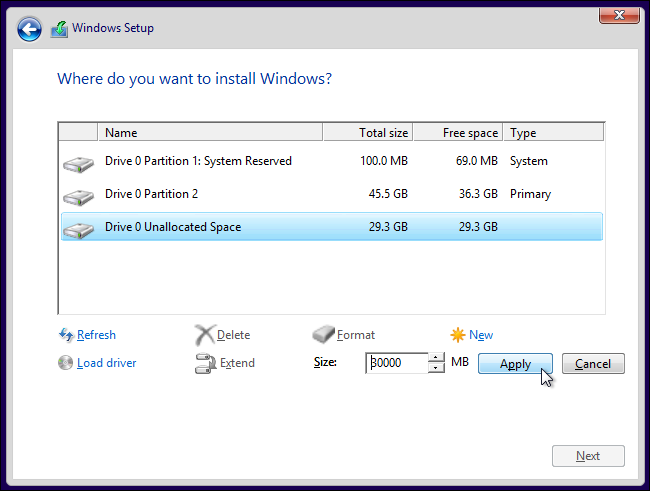 As you are running Windows 8 on your PC, you need to have some space to install 10. Your current OS requires at least 20 GB free HD space, so I assume that Windows 10 needs a bit more. If you have any free disk, just skip this task and install Windows 10 on that empty drive. This task should be completed if you are going to install Windows 10 on the very same hard disk. 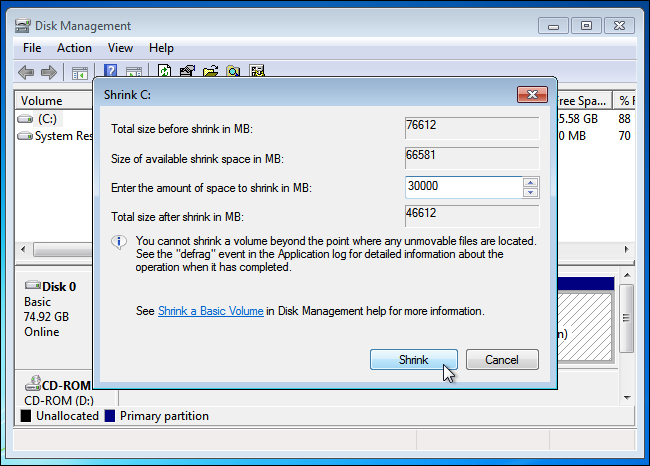 Here, I am shrinking my Local Disk C.
You don’t need any third- party software to shrink a partition. There is one cool tool available in Windows 8 by default. It is none other than Disk Management utility. Press Win key and R simultaneously. Soon, you will get Run dialogue box. It just functions as a small command prompt. All you have to do is type ‘diskmgmt.msc’ in the given field and press Enter. You can see a new window titled Disk Management. Wait some time to get it loaded. After that, all of your partitions will be displayed. Select one with at least 30 GB free space to install Windows 10. 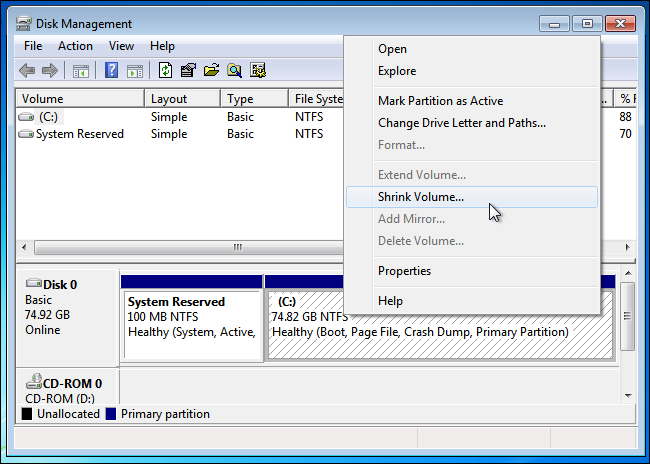 Right click on the selected partition and click on Shrink Volume. In the field right to Enter the amount of space to shrink in MB, type 30000. If your disk has more free space, no problem in going beyond 30000 MB. Then, click on Shrink. That’s all. Wait some time to finish the process. Now, you have 30 GB (or more than that) in your hard disk. It’s time to install the new guy. With the regular option, you only get a chance to upgrade. At the end of the day, your current OS will vanish. So we have to make a bootable DVD or flash drive for dual booting purpose. Microsoft itself has provided a tool to burn Windows 10 ISO file to your removable media. 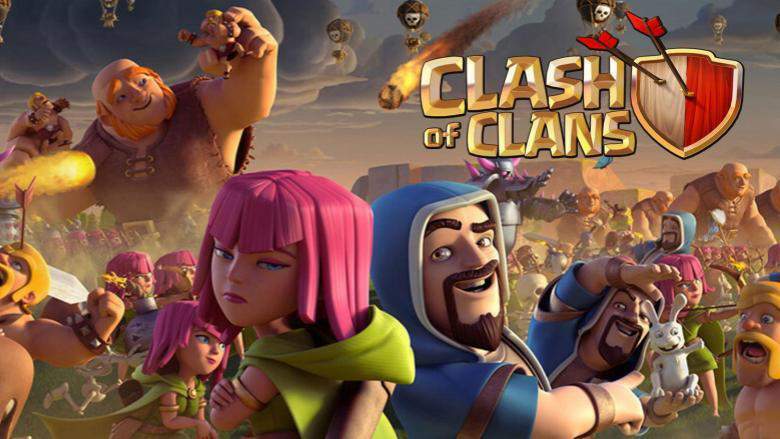 Visit here and choose between 32 bit and 64 bit. Download the utility and run it (Don’t forget to insert an empty DVD or USB flash drive before running it). 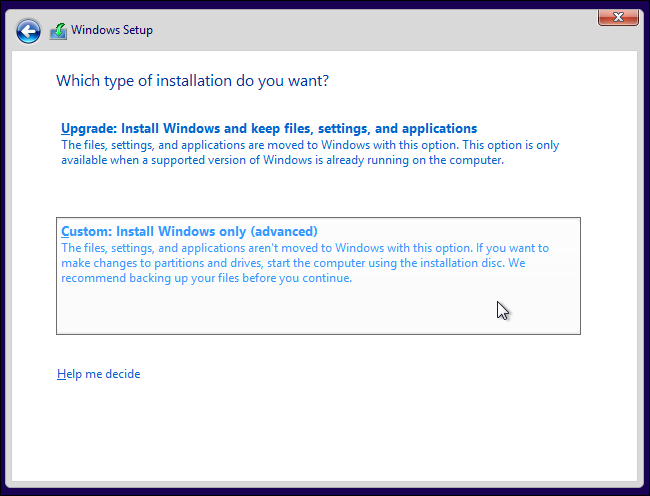 You will be asked to choose between upgrade and Create installation media for another PC. Select the second one. Follow next steps. That’s all. You have a bootable DVD or USB flash now. Next step has a vital role to dual boot Windows 10 alongside Windows 8. 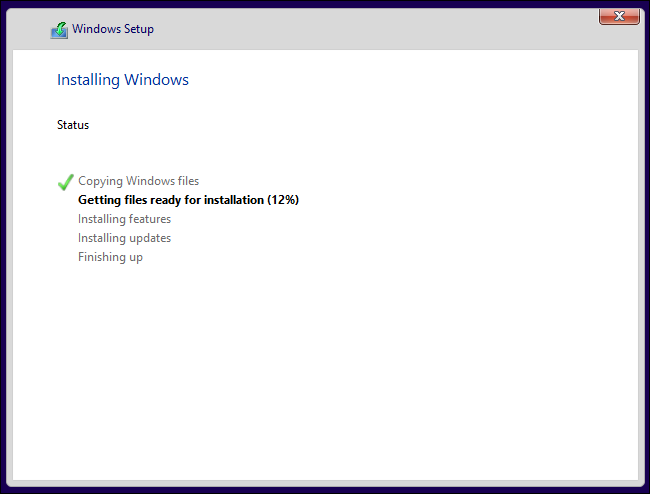 You can run Windows 10 installer as any other OS installer. But, don’t remove the storage media from your computer. At first, enter the BIOS settings and change the boot priority options. Make your external storage media (one with Windows 10 files) the primary boot device. Or you can choose the boot menu right at the time of startup by continuously tapping F8 (different from computer to computer). Go through the installation process as usual. You will be asked to select language and keyboard layout. After doing that, you would able to see a license agreement. Agree to it. Next step is important. You will get two options. First one is to upgrade and the second one is to do a custom install. Select the second one. The first option will not let you to dual boot. Clicking on it ends up in upgrading your current version to Windows 10. From the next list of partition, select ‘unallocated space’ that will probably be the new partition you have created before a while. Click on New to create a new partition. It is also possible to decrease the size into which the OS gets installed. By Default, it will take all the available space for that partition. Click on Apply and you will be done with the Partition task. Then, click Next. That’s all. 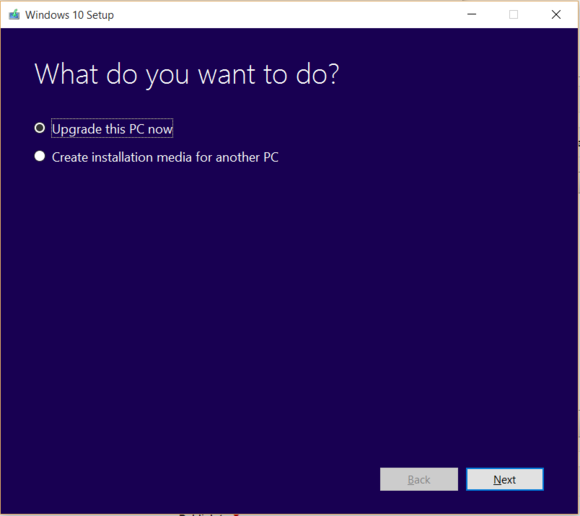 You have done all the steps that are needed to install Windows 10. Wait till the process gets completed. Usually, it takes almost 20 minutes. The system will boot again. At this time, you can see two options to go with (one your current OS, Windows 8 and the other, Windows Technical Preview or Windows 10). See the featured image. I think you have got a clear information on how to dual boot Windows 10 with Windows8. Check out How to Install Windows 10 on VMware Workstation? Are you ready to Dual Boot Windows 10 alongside Windows 8? I gave you all the details you should know before setting up a dual booting machine. Now, the table has turned. It’s you who need to take action. I have already published some guides for Windows 10. Check those to get the requirements overview. Don’t drive yourself into trouble if your system doesn’t meet the requirements. Do let me know if you have any queries regarding this topic and don’t forget to share this with your friends.